Pro-fragrance copolymeric compounds are described, which provide improved substantivity to surfaces, especially fabrics and which can be easily incorporated in a variety of formulations, particularly in aqueous formulations like detergents and cleaning agents as well as cosmetic preparations without being subject to excessive hydrolysis in the formulation. The pro-fragrance copolymeric compounds enable a long-lasting release of fragrance aldehydes and/or ketones. The invention relates to pro-fragrance copolymeric compounds obtainable by the copolymerization of specific monomers, their use and detergents and cleaning agents containing same, fabric softeners and cosmetics as well as a method for prolonging the scent perception of such agents. An alternative to direct addition of scent substances to detergents and cleaning agents, fabric softeners and cosmetics is the use of so-called pro-fragrances. By analogy with prodrugs, pro- fragrances are chemical derivatives of a scent, which reduce the volatility of the scent, for example, and allow delayed release of the scent over time under ambient conditions. By derivatization of scents, such as scent aldehydes or scent ketones, the vapor pressure of these compounds can be lowered. Since the derivatization reaction is reversible, the chemically bound perfume aldehyde or perfume ketone may under certain conditions, e.g., ambient conditions, be cleaved at the bonding site. This releases the perfume or scent substance, which was stored before in the pro-fragrance molecule or compound. This makes a prolonged scent impression possible. The object of the present invention is to provide pro-fragrances which allow a prolonged scent impression with scent aldehydes and/or scent ketones. R9 represents a hydrophilic moiety, which contains a polar functional group preferably selected from ether (alkoxy-group), ester (alkoxycarbonyl- group), amide (carboxamide-group), carbonate, carboxyl, carboxylic acid sodium salt, carboxylic acid amine salt, sulfone, sulfoxid, sulfonyl, sulfonic acid sodium salt, sulfonic acid amine salt, phosphonyl, phosphonic acid sodium salt, phosphonic acid amine salt, pyridinium and ammonium groups. 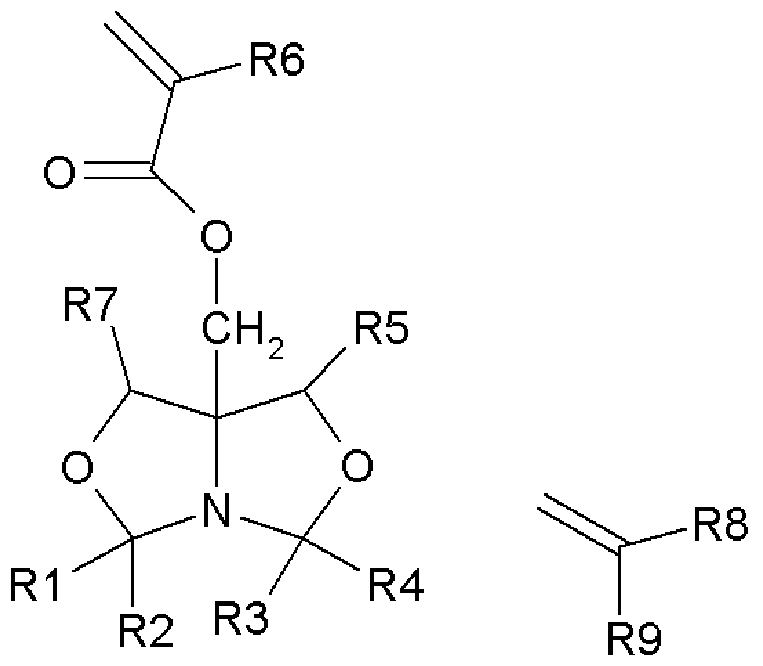 These aforementioned pro-fragrance compounds, which are obtainable by the copolymerization of a monomer of formula (A) and a monomer of formula (B), are called "inventive copolymeric compounds" in the following. The inventive copolymeric compounds work as pro-fragrances. They can store aldehydes and/or ketones and release them by hydrolysis. Thus, an improved fragrance release profile can be provided, especially at neutral or slightly acidic pH conditions. By improved fragrance release profile is meant preferably a favourable balance between the concentration of fragrance released (odour impact) and the durability of the fragrance release. The odor impression of the fragrance during fragrance release is not adulterated by any odorant side-products resulting from the cleavage of the pro-fragrance compound. These pro-fragrances further provide improved substantivity to surfaces, especially fabrics. Furthermore, the pro-fragrances according to the invention can be easily incorporated in a variety of formulations, particularly in aqueous formulations like detergents and cleaning agents as well as cosmetic preparations without being subject to excessive hydrolysis in the formulation. The pH-value of the formulation itself should preferably be > 7, especially if the formulation is aqueous. wherein R1 1 is selected from any linear and branched C2-30, preferably C2.20, most preferably C2-10 alkyl group and wherein R12 represents a hydrogen atom or a methyl group. In a preferred embodiment of the invention the moiety R10 in formula (C) is — (CH2CH2 — O — )nH or — (CH2CH2 — O — )nCH3, wherein n is a number from 1 to less than 50. The term "hydrophilic moiety" means that this moiety shows a distinctive interaction with polar solvents, especially water. This leads to an improved water solubility of the inventive copolymeric compounds. Typical hydrophilic groups are for example polyether chains (ethoxylate chains). Other hydrophilic groups are well known to those persons skilled in the art. If according to formula (A) in the structural element -CR1 R2 the radicals R1 and R2 and in the structural element -CR3R4 the radicals R3 and R4 together each have at least four carbon atoms, preferably at least five carbon atoms, then a preferred embodiment of the invention is given. If aldehydes are stored in the inventive copolymeric compounds, then each aldehyde should preferably contain at least five carbon atoms. In another preferred embodiment of the invention the moieties R2, R4, R5, R6, R7 in formula (A) independently of one another denote hydrogen or methyl and R1 and R3 each denote a C4.24 hydrocarbon radical, preferably a C5.24 hydrocarbon radical. In a preferred embodiment of the invention the monomer (B) should not be 2,5-dichlorostyrene. 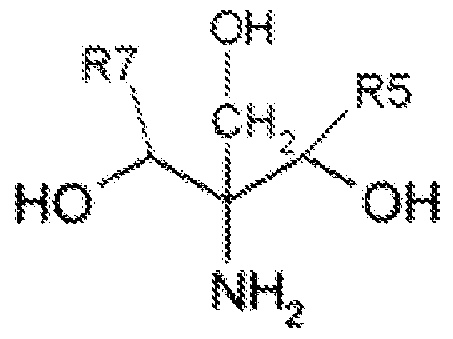 In another preferred embodiment of the invention the monomer (B) should not be 2,5-butyl acrylate. The inventive copolymeric compounds and/or the mixtures containing these compounds are used according to this invention as pro-fragrances, wherein the compounds release scent aldehydes and/or scent ketones as scent substances, in particular in the context of the use of detergents and cleaning agents, fabric softeners and cosmetics, preferably after applying in aqueous medium at a pH below 7, more preferably at a pH of < 5. The present invention thus relates to detergents or cleaning agents, fabric softeners or cosmetics, which contain the inventive copolymeric compounds or mixtures of such compounds. Such detergents or cleaning agents, fabric softeners or cosmetics are preferred wherein the pH-value of the agent is > 7. The invention also relates to a method for prolonging the scent perception of detergents and cleaning agents, fabric softeners and cosmetics or solid surfaces treated with these, whereby the inventive copolymeric compounds or mixtures containing same are incorporated into the cleaning agents or detergents, fabric softeners or cosmetics. The inventive copolymeric compounds and/or the mixtures containing these compounds allow a reduction in vapor pressure of the scent aldehydes and scent ketones, which can be released, and prolong the scent impression. Furthermore, the deposition of the inventive copolymeric compounds on solid surfaces such as textiles, skin or hard surfaces is excellent. Besides, the inventive copolymeric compounds provide an added value as they also are able to extend the fragrance effect even of those fragrances which are not bound in the inventive copolymeric compounds. (D) with compounds of general formula R1-C(=O)-R2 and R3-C(=O)-R4 ,for example octanal, with ring closure. Preferably, R1-C(=O)-R2 and R3-C(=O)-R4 represent the same molecule. The compounds of general formula (D) are derived from 2-amino-1 ,3-propanediol. R7 and R5 preferably denote H. The reaction is preferably performed in a suitable solvent or in situ. Suitable solvents include, for example, hydrocarbons containing aromatics, e.g., toluene. The reaction is preferably performed at a temperature in the range of 80 to 15O0C, especially preferably 100 to 14O0C. For example, the compound of general formula (D) is used as the starting material under a nitrogen atmosphere together with the desired ketone or aldehyde in the solvent. Then the reaction mixture is heated, whereupon the solids gradually go into solution. The mixture is then often heated at reflux on a water separator. The resulting reaction product is isolated by conventional methods and purified if necessary. The amount of bicyclic compounds [formula (C)] to monocyclic compounds may be adjusted easily through the choice of the molar ratios between aldehyde/ketone and the compounds of general formula (D). Large amounts of bicyclic structures are especially preferred. Such mixtures preferably contain at least 50 wt%, preferably at least 65 wt%, in particular at least 80 wt%, in the best way 100 wt% of bicyclic structures. The bicycle-oxazolidine-type copolymer itself is obtainable by copolymerization of a monomer of formula (A) and a monomer of formula (B), for example in 1 ,4-dioxane with 2,2'- azobisisobutyronitrile via radical polymerization. The synthesis, starting from compounds of general formula (D), will be explained in more detail in the example section at the end of the specification. In the inventive pro-fragrance copolymeric compound obtainable by the copolymerization of a monomer of formula (A) and a monomer of formula (B) all the conventional scent aldehydes and scent ketones which are typically used to achieve a pleasant scent perception may be used as the scent aldehydes or scent ketones. Those skilled in the art are aware of suitable scent aldehydes and scent ketones. Scent ketones may include all ketones that can impart a desired scent or a fresh perception. Mixtures of different ketones may also be used. For example, the ketone may be selected from the group comprising buchu oxime; isojasmone; methyl-β-naphthyl ketone, musk indanone; tonalide/musk plus; α-damascone, β-damascone, δ-damascone, isodamascone, damascenone, damarose, methyl dihydrojasmonate, menthone, carvone, camphor, fenchone, α- ionene, β-ionone, dihydro-β-ionone, γ-methyl so-called ionone, fleuramone, dihydrojasmone, cis- jasmone, iso-E-super, methyl cedrenyl ketone or methyl cedrylone, acetophenone, methyl acetophenone, paramethoxyacetophenone, methyl-β-naphthyl ketone, benzylacetone, benzophenone, parahydroxy-phenylbutanone, celery ketone or livescone, 6-isopropyl- decahydro-2-naphthone, dimethyloctenone, freskomenth, 4-(l-ethoxyvinyl)-3,3,5,5- tetramethylcyclohexanone, methylheptenone, 2-(2-(4-methyl-3-cyclohexen-1- yl)propyl)cyclopentanone, 1-(p-menthen-6(2)-yl)-1-propanone, 4-(4-hydroxy-3-methoxyphenyl)-2- butanone, 2-acetyl-3,3-dimethylnorbornane, 6,7-dihydro-1 , 1 ,2,3,3-pentamethyl-4(5H)indanone, 4-damascole, dulcinyl or cassion, gelsone, hexalone isocyclemon E, methyl cyclocitron, methyl lavendel ketone, orivone, para-tert-butylcyclohexanone, verdone, delphone, muscone, neobutenone, plicatone, veloutone, 2,4,4,7-tetramethyloct-6-en-3-one, tetramerane, hedione and mixtures thereof. The ketones may preferably be selected from α-damascone, δ-damascone isodamascone, carvone, γ-methylionone, iso-E-super, 2,4,4,7-tetramethyloct-6-en-3-one, benzylacetone, β-damascone, damascenone, methyl dihydrojasmonate, methyl cedrylone, hedione and mixtures thereof. Suitable scent aldehydes may be any aldehydes, which impart a desired scent or a fresh perception according to the scent ketones. These may again be individual aldehydes or aldehyde mixtures. Suitable aldehydes include for example melonal, triplal, ligustral, adoxal; anisaldehyde; cymal; ethyl vanillin; florhydral; helional; heliotropin; hydroxycitronellal; koavone; lauryl aldehyde, lyral, methyl nonylacetaldehyde; p,t-bucinal; phenyl acetaldehyde; undecylene aldehyde; vanillin; 2,6,10-trimethyl-9-undecenal, 3-dodecen-l-al, α-n-amylcinnamaldehyde, 4-methoxybenzaldhyde, benzaldehyde, 3-(4-tert-butylphenyl)propanal, 2-methyl-3-(para-methoxyphenylpropanal), 2-methyl-4-(2,6,6trimethyl-2(1 )-cyclohexen-1-yl)butanal, 3-phenyl-2-propenal, cis-/trans-3,7- dimethyl-2,6-octadien-l-al, 3,7-dimethyl-6- octen-l-al, [(3,7-dimethyl-6octenyl)oxy]acetaldehyde, 4-isopropylbenzaldehyde, 1 ,2,3,4,5,6,7,8-octahydro8,8-dimethyl-2-naphthaldehyde, 2,4-dimethyl-3- — cyclohexen-i-carboxyaldehyde, 2-methyl3(isopropylphenyl)propanal, decylaldehyde, 2,6- dimethyl-5-heptenal; 4-(tricyclo(5.2.1.0(2,6)]decylidene-8)butanal; octahydro-4,7-methano-IH- indenecarboxaldehyde; 3-ethoxy-4-hydroxybenzaldehyde, para-ethyl-α,α- dimethylhydrocinnamaldehyde, α-methyl-3,4(methylenedioxy)hydrocinnamaldehyde, 3,4- methylenedioxybenzaldehyde, α-n-hexylcinnamaldehyde, m-cymene-7-carboxaldehyde, α-methyl- phenylacetaldehyde, 7-hydroxy-3,7-dimethyloctanal, undecenal, 2,4,6-trimethyl-3-cyclohexene-l- carboxaldehyde, 4-(3)(4-methyl-3-pentenyl)-3cyclohexene carboxaldehyde, 1-dodecanal, 2,4- dimethylcyclohexene-3-carboxaldehyde, 4-(4-hydroxy-4-methylpentyl)-3-cyclohexene-l-carbox- aldehyde, 7-methoxy-3,7-dimethyloctan-1-al, 2-methylundecanal, 2-methyldecanal, 1-nonanal, 1-octanal, 2,6,10-trimethyl-5,9-undecadienal, 2-methyl-3-(4-tert-butyl)propanal, dihydrocinnamaldehyde, 1-methyl-4-(4-methyl-3-pentenyl)-3-cyclohexene-1-carboxaldehyde, 5- or 6- methoxyhexahydro-4,7-methanoindan-1- or 2-carboxyaldehyde; 3,7-dimethyloctan-1-al, 1- undecanal, 10-undecen-1-al, 4-hydroxy-3methoxybenzaldehyde, 1-methyl-3-(4-methylpentyl)-3- cyclohexenecarboxyaldehyde, 7-hydroxy-3,7dimethyloctanal; trans-4-decenal, 2,6-nonadienal, para-tolylacetaldehyde; 4-methylphenylacetaldehyde, 2-methyl-4-(2,6,6-trimethyl-1-cyclohexen-1- yl)-2-butenal, ortho-methoxycinnamaldehyde, S.δ.θ-trimethyl-S-cyclohexenecarboxaldehyde; 3,7- dimethyl-2-methylene-6-octenal, phenoxyacetaldehyde; 5,9-dimethyl-4,8-decadienal, peony aldehyde (6,10-dimethyl-3-oxa-5,9-undecadien-1-al), hexahydro-4,7-methanoindane-1- -carboxaldehyde, 2-methyloctanal, α-methyl-4-(l-nnethylethyl)benzeneacetaldehyde, 6,6-dimethyl- 2-norpinene-2-propionaldehyde, para-methylphenoxyacetaldehyde; 2-methyl-3-phenyl-2-propen-1- al, 3,5,5-trimethylhexanal, hexahydro-8,8-dimethyl-2-naphthaldehyde, 3-propylbicyclo[2.2.1]-hept- 5-ene-2-carbaldehyde, 9-decenal, 3-methyl-5-phenyl-1-pentanal, methylnonylacetaldehyde, 1-p- menthene-q-carboxaldehyde, citral or mixtures thereof, lilial citral, 1 -decanal, florhydral, 2,4- dimethyl-3-cyclohexene-i-carboxaldehyde; preferred aldehydes may be selected from cis/trans- 3,7-dimethyl-2,6octadien-l-al; heliotropin; 2,4,6-trimethyl-3-cyclohexene-l-carboxaldehyde; 2,6- nonadienal; α-n-amylcinnamaldehyde, α-n-hexylcinnamaldehyde, p-tert-bucinal; lyral, cymal, methyl-nonylacetaldehyde, trans-2-nonenal, lilial, trans-2-nonenal and mixtures thereof. According to a preferred embodiment of the invention especially preferred scent aldehydes and scent ketones are selected from the jasmonenes, ionones, damascones and damascenones, menthone, carvone, iso-E-Super, methyl heptenone, melonal, cymal; ethyl vanillin; helional; hydroxycitronellal; koavone; methyl nonylacetaldehyde; phenyl acetaldehyde; undecylene aldehyde; 3-dodecen-l-al, α-n-amylcinnamaldehyde, benzaldehyde, 3-(4-tert-butylphenyl)propanal, 2-methyl-3-(para-methoxyphenylpropanal), 2-methyl-4-(2,6,6trimethyl-2(1 )-cyclohexen- 1-yl)butanal, 3-phenyl-2-propenal, cis-/trans-3,7-dimethyl-2,6octadien-l-al, 3,7-dimethyl6octen-l-al, [(3,7-dimethyl-6-octenyl)oxy]acetaldehyde, 4-isopropylbenzaldehyde, 2,4-dimethyl-3-cyclohexane- 1-carboxyaldehyde, 2-methyl-3(isopropylphenyl)propanal, decylaldehyde, 2,6-dimethyl-5-heptenal; α-n-hexylcinnamaldehyde, 7-hydroxy-3,7-dimethyloctanal, undecenal, 2,4,6-trimethyl-3-cyclo- hexene-l-carboxaldehyde, 1-dodecanal, 2,4-dimethylcyclohexene-3-carboxaldehyde, 4-(4-hydroxy- 4-methylpentyl)-3-cyclohexene-l-carboxaldehyde, 2-methylundecanal, 2-methyldecanal, 1-nonanal, 1-octanal, 2,6,10-trimethyl-5,9-undecadienal, 2-methyl-3-(4-tert-butyl)propanal, dihydrocinnamaldehyde, 3,7-dimethyloctan-i-al, 1-undecanal, 10-undecen-1-al, 4-hydroxy-3- methoxybenzaldehyde, trans-4-decenal, 2,6-nonadienal, para-tolylacetaldehyde; 3,7-dimethyl-2- methylene-6-octenal, 2-methyloctanal, α-methyl-4-(l-methylethyl)benzeneacetaldehyde, 2-methyl- 3-phenyl-2-propen-1-al, 3,5,5-trimethylhexanal, 3-propylbicycle[2.2.1]hept-5-ene-2-carbaldehyde, 9-decenal, 3-methyl-5-phenyl-1-pentanal, methylnonylacetaldehyde, citral, 1-decanal, florhydral, 2,4-dimethyl-3-cyclohexene-1-carboxaldehyde, heliotropin. The scent aldehydes and scent ketones may have an aliphatic, cycloaliphatic, aromatic, ethylenically unsaturated structure of a combination of these structures. Furthermore, additional heteroatoms or polycyclic structures may also be present. The structures may have suitable substituents such as hydroxyl groups or amino groups. As already explained above, the inventive pro-fragrance copolymeric compounds or the mixture containing them are used according to the invention as pro-fragrances. The term "pro-fragrance" describes derivatives of scent aldehydes and scent ketones which release the original scent aldehydes and scent ketones under ambient conditions. Ambient conditions are the typical ambient conditions in the human biosphere and/or the conditions encountered on human skin. The inventive copolymeric compounds disintegrate slowly under ambient conditions and release the original scent aldehydes and/or scent ketones. The chemically bound perfume aldehydes and perfume ketones are cleaved at the binding site, thereby releasing the perfume substances again. Accordingly, the use of the inventive copolymeric compound as pro-fragrances which as scent substances preferably release scent aldehydes or scent ketones is especially preferred. The inventive copolymeric compounds may be used as the single scent substance, but it is also possible to use mixtures of scent substances, which are comprised only partially of the inventive pro-fragrances. In particular scent substance mixtures containing 1 to 50 wt%, preferably 5 to 40 wt% and in particular max. 30 wt% of inventive copolymeric compounds may be used. In other embodiments in which the delayed scent effect of the carrier-bound form is to be used in particular, advantageously at least 30 wt%, preferably at least 40 wt% and in particular at least 50 wt% of the total perfume contained in an agent is introduced into the agent via the inventive copolymeric compounds with the inventive use, whereas the remaining 70 wt%, preferably 60 wt% and in particular 50 wt% of the total perfume present in the agent is sprayed as usual or is otherwise introduced into the agent. The inventive use may thus advantageously be wherein the inventive copolymeric compounds are used together with other scent substances. Through the distribution of the total perfume content of an agent, e.g., a detergent or cleaning agent in perfume, which is present in the form of the inventive copolymeric compounds and perfume that has been incorporated traditionally, a variety of product characteristics can be implemented which become possible only through the inventive use. For example, it is conceivable and possible to divide the total perfume content of an agent into two portions x and y, whereby the portion x comprises inventive copolymeric compounds and the portion y comprises traditional perfume oils. The only limit with the inventive copolymeric compounds is that the scents which are introduced via the inventive pro-fragrances must originate from the group of scent aldehydes or scent ketones. The scent substances that may be incorporated into the agents in the traditional way are, however, not subject to any restrictions. Individual perfume substance compounds of natural or synthetic origin, e.g., of the type of esters, ethers, aldehydes, ketones, alcohols and hydrocarbons may thus be used as the perfume oils and/or scent substances. However, mixtures of various perfume substances which jointly produce an attractive scent note are preferred. Such perfume oils may also contain mixtures of natural perfume substances such as those accessible from plant sources, e.g., pine oil, citrus oil, jasmine oil, patchouli oil, rose oil or ylang-ylang oil and so on. Other traditional perfume substances that may be used within the scope of the present invention include, for example, essential oils such as lemon oil or cypress oil and so on. The pro-fragrances are preferably used in detergents and cleaning agents, fabric softeners and cosmetics. These may be solid, gel or liquid formulations, and solid formulations may be in the form of powder, granules, tablets or tabs. Liquid formulations may be solutions, emulsions or dispersions. Detergents may be used for manual or machine washing of textiles in particular. They may be detergents or cleaning agents for industrial use or for the household area. Cleaning agents may be used for cleaning hard surfaces, for example. They may be dishwasher detergents, for example, which are used for manual or machine cleaning of dishes. They may also be conventional industrial or household cleaners with which hard surfaces such as furniture surfaces, flagstones, ceramic tiles, wall coverings and floor coverings are cleaned. Fabric softeners include in particular fabric softeners that are used for treating textiles during or after being laundered. The cosmetics may be pastes, ointments, creams, emulsions, lotions and solutions, in particular alcohol-based solutions, which are known from fine perfumery, for example. The individual agents may be applied in any suitable form. For example, these may be agents to be applied by spraying. The inventive copolymeric compounds may also be used to cover bad odors, which adhere well to solid surfaces when combined with other absorbents, for example. The invention also relates to detergents or cleaning agents, fabric softeners or cosmetics which contain the inventive compounds or mixtures. The compounds or mixtures are used in an amount sufficient for the effect. Typically, the inventive copolymeric compounds or mixtures containing them are used in amounts of less than 10 or less than 5 wt% in end formulations, i.e., ready-to-use detergents or cleaning agents, fabric softeners or cosmetics. Typical the inventive copolymeric compounds or mixtures containing them are used in amounts from 0,0001 wt% to less than 5 wt%, preferably less than 2 wt%, in particular less than 1 wt%, in end formulations, based on the total amount of the whole end formulations. But it is also possible to work with high active ingredient concentrations, for example of up to 40 wt% of the inventive copolymeric compounds, especially in fine perfumery. The total amount of scent substances, including the inventive copolymeric compounds, in the detergents or cleaning agents, however, is preferably between 0.001 and 10 wt%, especially preferably between 0.1 and 5 wt% and most especially preferably between 0.5 and 2 wt%, based on the total amount of the agent. Those skilled in the art are familiar with compositions of conventional detergents or cleaning agents, fabric softeners and cosmetics. Detergents and cleaning agents and fabric softeners may contain conventional ingredients of detergents and cleaning and fabric softeners, such as surfactants, builder substances, bleaching agents, other scent substances, enzymes and other active ingredients, but also disintegration aids, so-called tablet disintegrants, to facilitate the disintegration of highly compressed tablets and tabs and to shorten the disintegration times. Surfactants in particular are among the essential ingredients of detergents and cleaning agents and fabric softeners. The surfactant content will be selected to be higher or lower, depending on the intended use of the inventive agents. The surfactant content of detergents is usually between 5 and 40 wt%, preferably between 10 and 30 wt% and in particular between 15 and 25 wt%, whereas cleaning agents for dishwashing machines contained between 0.1 and 15 wt%, preferably between 0.5 and 7.5 wt% and in particular between 1 and 5 wt% surfactant, for example. The surfactant substances preferably originate from the group of anionic, nonionic, zwitterionic or cationic surfactants but for economic reasons and because of their performance spectrum, anionic surfactants are definitely preferred in washing and cleaning. - condensation products of C8-C30 fatty alcohols with protein hydrolysates and/or amino acids and their derivatives with which those skilled in the art are familiar as protein-fatty acid condensates such as Lamepon® grades, Gluadin® grades, Hostapon® KCG or the Amisoft® grades. Preferred anionic surfactants include alkyl sulfates, alkylpolyglycol ether sulfates and ether carboxylic acids with 10 to 18 carbon atoms in the alkyl group and up to 12 glycol ether groups in the molecule, sulfosuccinic acid monoalkyl and dialkyl esters with 8 to 18 carbon atoms in the alkyl group and sulfosuccinic acid monoalkylpolyoxyethyl esters with 8 to 18 carbon atoms in the alkyl group and 1 to 6 oxyethyl groups, monoglyceride sulfates, alkyl and alkenyl ether phosphates and protein-fatty acid condensates. Cationic surfactants may also be used. Preferred according to this invention are cationic surfactants of the quaternary ammonium compound type, esterquats and amidoamines. Esterquats are known substances which contain at least one ester function as well as at least one quaternary ammonium group as a structural element. Preferred esterquats are quaternated ester salts of fatty acids with triethanolamine, quaternated ester salts of fatty acids with diethanolalkylamines and quaternated ester salts of fatty acids with 1 ,2-dihydroxypropyldialkylamines. Such products are distributed under the brand names Stepantex®, Dehyquart® and Armocare®, for example. The products Armocare® VG H-70, and N,N-bis(2-palmitoyloxyethyl)dimethylammonium chloride as well as Dehyquart® F-17, Dehyquart® C-4046, Dehyquart® L80 and Dehyquart® AU-35 are examples of such esterquats. The cationic surfactants are preferably present in the inventive agents in amounts of 0.05 to 10 wt%, based on the total application preparation. Amounts of 0.1 to 5 wt% are especially preferred. — sugar surfactants of the fatty acid N-alkylpolyhydroxyalkylamide type. Preferred nonionic surfactants have proven to be the alkylene oxide addition products onto saturated linear fatty alcohols and fatty acids each with 2 to 30 mol ethylene oxide per mol fatty alcohol and/or fatty acid. Preparations with excellent properties are also obtained when they contain fatty acid esters of ethoxylated glycerol as the nonionic surfactants. In addition, the sugar surfactants may also be used as nonionic surfactants. Nonionic surfactants are preferably used in amounts of 0.1 to 20 wt%, based on the respective total composition. Amounts of 0.5 to 15 wt% are especially preferred and amounts of 0.5 to 7.5 wt% are most especially preferred. The surfactants are usually used in amounts of 0.1 to 45 wt%, preferably 0.5 to 30 wt% and most especially preferably from 0.5 to 25 wt%, each based on the respective total composition. The amount used depends essentially on the intended purpose of the inventive agent. If it is a shampoo or another cleaning agent, surfactant amounts of more than 45 wt% are possible. Another important group of fabric softener ingredients, detergent and cleaning agent ingredients is the builder substances. This substance class is understood to include both organic and inorganic builder substances. These are compounds that can have a carrier function in the inventive agents as well as acting as a water softener substance in use. Suitable builders include, for example, alkali metal gluconates, citrates, nitrilotriacetate, carbonates and bicarbonates, in particular sodium gluconate, citrate and nitrilotriacetate as well as sodium and potassium carbonate and bicarbonate and alkali metal hydroxides and alkaline earth metal hydroxides, in particular sodium and potassium hydroxide, ammonium and amines, in particular mono- and triethanolamine and/or mixtures thereof. These also include the salts of glutaric acid, succinic acid, adipic acid, tartaric acid and benzenehexacarboxylic acid as well as phosphonates and phosphates. Usable organic builder substances include, for example, the polycarboxylic acids that may be used in the form of their sodium salts, where polycarboxylic acids are understood to include those carboxylic acids having more than one acid function. For example, these include citric acid, adipic acid, succinic acid, glutaric acid, malic acid, tartaric acid, maleic acid, fumaric acid, sugar acids, aminocarboxylic acids, nitrilotriacetic acid (NTA), if such a use is not objectionable for ecological reasons, as well as mixtures thereof. Preferred salts include the salts of polycarboxylic acids such as citric acid, adipic acid, succinic acid, glutaric acid, tartaric acid, sugar acids and mixtures thereof. The acids per se may also be used. In addition to their builder effect, the acids typically also have the property of an acidifying component and thus also serve to adjust a lower and milder pH of detergents or cleaning agents, as in the inventive granules, for example. Citric acid, succinic acid, glutaric acid, adipic acid, gluconic acid and any mixtures thereof may be mentioned here in particular. Also polymeric polycarboxylates are suitable as builders, including the alkali metal salts of polyacrylic acid or polymethacrylic acid, e.g., those with a relative molecular weight of 500 g/mol to 70,000 g/mol. The (co)polymeric polycarboxylates may be used either as a powder or as an aqueous solution. The (co)polymeric polycarboxylate content of the agents is preferably 0.5 to 20 wt%, in particular 3 to 10 wt%. Another substance class with co-builder properties are the phosphonates. These are in particular hydroxyalkanephosphonates and/or aminoalkanephosphonates. 1-hydroxyethane-1 ,1- diphosphonate (HEDP), ethylenediaminetetramethylenephosphonate (EDTMP) as well as diethylenetriaminepentamethylenephosphonate (DTPMP) are especially preferred. In addition, all compounds capable of forming complexes with alkaline earth ions may also be used as co- builders. A preferred inorganic builder is a finely crystalline synthetic zeolite containing bound water. Suitable partial substitutes for zeolites include sheet silicates of natural and synthetic origin. Their usability is not limited to a specific composition and/or structural formula. However, smectites, in particular bentonites, are preferred here. It is of course also possible to use the generally known phosphates as builder substances if such a use should not be avoided for ecological reasons. In particular the sodium salts of orthophosphates, pyrophosphates and in particular tripolyphosphates are suitable. The agents contain builders preferably in amounts, based on the composition, of 0 to 50 wt% preferably 0.01 to 30 wt% in particular 0.1 to 20 wt%, extremely preferably 0.3 to 10 wt%. In addition the inventive detergents and cleaning agents may additionally contain one or more substances from the group of bleaching agents, bleach activators, enzymes, pH adjusting agents, fluorescent agents, dyes, foam inhibitors, silicone oils, anti-redeposition agents, optical brighteners, graying inhibitors, dye transfer inhibitors, corrosion inhibitors and silver protectants. These substances are described below. Of the compounds that yield H2O2 in water and serve as bleaching agents, sodium perborate tetrahydrate, sodium perborate monohydrate and sodium percarbonate are especially important. Other bleaching agents that may be used include, for example, peroxypyrophosphates, citrate perhydrates and peracid salts or peracids that supply H2O2 such as perbenzoates, peroxophthalates, diperazelaic acid, phthaloimino peracid or diperdodecanedioic acid. Substances that release chlorine or bromine may also be used as bleaching agents in agents for machine dishwashing of the suitable materials that release chlorine or bromine, heterocyclic N-bromo and N-chloroamides may be considered, e.g., trichloroisocyanuric acid, tribromoisocyanuric acid, dibromoisocyanuric acid and/or dichloroisocyanuric acid (DICA) and/or the salts thereof with cations such as potassium and sodium. Hydantoin compounds such as 1 ,3-dichloro-5,5-dimethylhydantoin are also suitable. To achieve an improved bleaching effect when washing or cleaning at temperatures of 6O0C or lower, bleach activators may also be incorporated into the inventive detergents and cleaning agents, in particular tetraacetyl- ethylenediamine (TAED), or n-nonanoyl- or isononanoyloxybenzene sulfonate (n- and/or iso- NOBS) are preferred. The enzymes that may be used include those from the class of proteases, lipases, amylases, cellulases and/or mixtures thereof. According to this invention, detergents and cleaning agents also include dishwashing agents. The inventive dishwashing agents may contain corrosion inhibitors to protect the washed utensils or the machine, whereby in particular silver protectants have a special importance in the field of machine dishwashing. In general, silver protectants selected from the group of triazoles, benzotriazoles, bisbenzotriazoles, aminotriazoles, alkylaminotriazoles and transition metal salts or complexes may be used in particular. Likewise, zinc compounds may be used to prevent corrosion of the washed utensils. Special ingredients that may be used in the inventive agents for machine dishwashing or for cleaning hard surfaces include substances to prevent resoiling of surfaces and/or to facilitate the release of dirt after a single use (so-called "soil-release compounds"). The soil-release compounds that may be used include all those compounds known in the state of the art. Especially suitable examples include cationic polymers, e.g., Hydroxypropyl- trimethylammonium guar, copolymers of aminoethyl methacrylate and acrylamide as well as copolymers of dimethyldiallylammonium chloride and acrylamide, polymers with imino groups, cationic cellulose derivatives, cationic homopolymers and/or copolymers (monomer units: quaternated ammonium alkyl methacrylate groups). This list of ingredients of fabric softeners and detergents and cleaning agents is by no means conclusive but instead merely gives the most essential typical ingredients of such agents. In particular, inasmuch as they are liquid or gel preparations, these agents may also contain organic solvents. These are preferably monovalent or polyvalent alcohols with 1 to 4 carbon atoms. Preferred alcohols in such agents include ethanol, 1 ,2-propanediol, glycerol as well as mixtures of these alcohols. In preferred embodiments, such agents contain 2 to 12 wt% of such alcohols. The agents may have different physical states. In another preferred embodiment, the fabric softeners, detergents or cleaning agents are liquid or gel agents, in particular liquid detergents or liquid dishwashing detergents or cleaning gels, and they may in particular also be cleaning agents in the form of gels for cleaning toilets. "Cleaner" in the broadest sense is a term for formulations (usually containing a surfactant) with a very wide area of application and a very different composition, depending on the application. The most important market segments are household cleaners, industrial (technical) cleaners and institutional cleaners. Depending on the pH, a distinction is made between alkaline, neutral and acidic cleaners; according to the form in which it is offered, a distinction is made between liquid and solid cleaners (also in tablet form). These so-called cleaners for hard surfaces should yield an optimal profile of use (in contrast with dishwashing agents, which are also classified in the product group of cleaners) both in a concentrated state and in dilute aqueous solution when combined with mechanical energy. Low-temperature cleaners manifest their effect without elevated temperature. Surfactants and/or alkali carriers, alternatively acids, optionally also solvents such as glycol ethers and lower alcohols are crucial for the cleaning effect. In general, the formulations also contain builders and, depending on the type of cleaner, bleaching agents, enzymes, microbicidal or disinfecting additives as well as perfume oils and dyes. In addition to the components already mentioned, the inventive agents may also contain other additives and aids, such as those customary in such agents. These include in particular polymers, soil-release active ingredients, solvents (e.g., ethanol, isopropanol, glycol ether), solubilizers, hydrotropes (e.g., cumenesulfonate, octyl sulfate, butyl glucoside, butyl glycol), cleaning enhancers, viscosity regulators (e.g., synthetic polymers, such as polysaccharides, polyacrylates, naturally occurring polymers and their derivatives such as xanthan gum, other polysaccharides and/or gelatins), pH regulators (e.g., citric acid, alkanolamines or NaOH), disinfectants, antistatics, preservatives, bleach systems, enzymes, dyes and opacifiers or skin protectants. The amount of such additives is usually no more than 12 wt% in the cleaning agent. The lower limit for use depends on the type of additive and may be up to 0.001 wt% or less in the case of dyes. The amount of auxiliaries is between 0.01 and 7 wt%, in particular 0.1 and 4 wt%. The aforementioned agents may also contain binders, which may be used alone or in mixture with other binders. Preferred binders include polyethylene glycols, 1 ,2-polypropylene glycols and modified polyethylene glycols and polypropylene glycols. Low-molecular polyvinylpyrrolidones and derivatives of these with relative molecular weights up to max. 30,000 are also suitable as binders. Relative molecular weight ranges between 3000 and 30,000 are preferred here, e.g., 10,000. Polyvinylpyrrolidones are preferably not used as exclusive binders but instead are used in combination with others, in particular in combination with polyethylene glycols. The inventive agents may contain, e.g., carbonate/citric acid systems as suitable and well-known disintegration aids, but other organic acids may also be used. Swelling disintegration aids include, for example, synthetic polymers such as polyvinylpyrrolidone (PVP) or natural polymers and/or modified natural substances such as cellulose and starch and their derivatives, alginate or casein derivatives. Within the scope of the present invention, disintegrants based on cellulose are used as the preferred disintegrants, so that preferably molded bodies of detergent and cleaning agent will contain such a disintegrant based on cellulose in amounts of 0.5 to 10 wt%, preferably 3 to 7 wt% and in particular 4 to 6 wt%. In a preferred variant, the detergents and cleaning agents, in particular in the form of molded bodies such as tablets, contain 0.5 to 10 wt%, preferably 3 to 7 wt% and in particular 4 to 6 wt% of one or more disintegration aids, each based on the weight of the molded body. Another subject matter of the present invention is cosmetics (cosmetic agents) for treatment of hair or skin, containing the inventive copolymeric compounds. These cosmetic (cosmetic agents) preferably contain the inventive copolymeric compounds in amounts of 0.001 to 10 wt%, preferably from 0.01 to 5 wt%, especially preferably 0.02 to 3 wt% and in particular in amounts of 0.05 to 2 wt%, each based on the total composition of the cosmetic agent. The total amount of scent substances in the cosmetic agents, however, is preferably between 0.01 and 5 wt%, especially preferably between 0.1 and 3 wt% and most especially preferably between 0.5 and 2 wt%, based on the total amount of the agent. Mixtures of various scent substances (from the various classes of scent substances mentioned above) which jointly produce an appealing scent note are preferably used. In this case, the total amount of the at least one scent substance is the amount of all scent substances in the mixture together, based on the total amount of the agent. In a preferred embodiment, the cosmetic agents are aqueous preparations that contain surfactant active ingredients and are suitable in particular for treatment of keratin fibers, in particular human hair, or for treatment of skin. The inventive cosmetics (cosmetic agents) usually contain other ingredients that are conventional for these agents. The inventive cosmetic agents preferably contain surfactant active ingredients or detergent-active ingredients as additional ingredients. The inventive cosmetics (cosmetic agents) may be present in different preparation forms. The most important are creams, lotions, oils and gels. Another subject matter of the present invention is the use of the inventive copolymeric compounds for prolonging the scent effect of scent substances. Owing to the excellent suitability of the inventive compounds for use in detergents and cleaning agents, use of the inventive copolymeric compounds in liquid or solid detergents and cleaning agents, in particular preferably as a scent substance, is another subject matter of the present invention. The inventive copolymeric compounds are likewise excellently suited for use in cosmetics (cosmetic agents) so another subject matter of the present invention is the use of the inventive copolymeric compounds in cosmetics (cosmetic agents) for the treatment of skin and hair, in particular preferably as a scent substance. A subject matter of the present invention is likewise the use of the inventive copolymeric compounds together with other conventional scent substances which are incorporated preferably by traditional methods into agents such as detergents and cleaning agents as well as fabric softeners and cosmetics. Another subject matter of the present invention is the method for prolonging the scent perception of detergents or cleaning agents, fabric softeners or cosmetics or solid surfaces treated with them, wherein the inventive copolymeric compounds or mixtures thereof are added to the detergents or cleaning agents, fabric softeners or cosmetics. The inventive copolymeric compounds then preferably gradually release the derivatized scent substances contained therein by hydrolysis. The inventive compounds and agents under ambient conditions have a good hydrolytic cleavability. They also have a good stability in storage in an alkaline environment, such as that encountered in detergents and dishwashing agents, for example. The invention also relates to a method for prolonging the scent perception of detergents or cleaning agents, fabric softeners or cosmetics or solid surfaces treated with these agents, wherein inventive compounds or mixtures thereof are incorporated into the detergents or cleaning agents, fabric softeners or cosmetics. The scent substances are then preferably released again by hydrolysis, preferably in aqueous medium at a pH below 7, more preferably at a pH of 5. The invention will now be illustrated in greater detail by the following examples. In a 300 ml_ two necks round-bottom flask assembled with a condenser Tris (hydroxymethyl)- amino-methane (TRIS) (6.06 g, 50 mmol, 1 eq), octanal (12.82 g, 100 mmol, 2 eq), and methanol (120 ml_) were added and brought to reflux for 3 hours. After cooling, the reaction mixture was concentrated under vacuum to obtain 1 as a colorless transparent viscous liquid (17.06 g, 100% yield). 1 was insoluble in water. 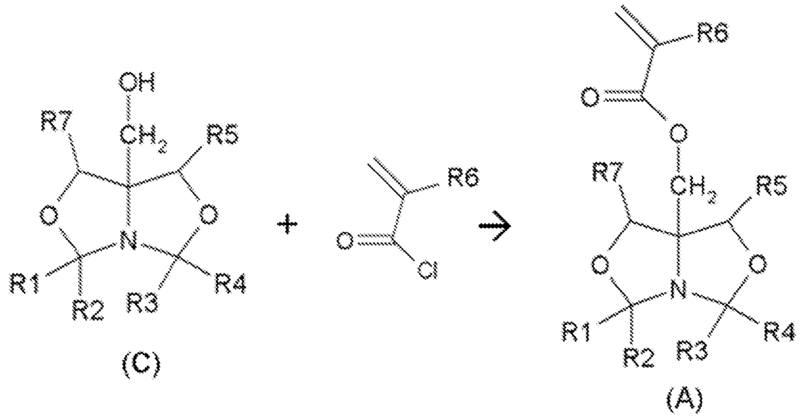 (b) Synthesis of monomer 2 by esterification of methacryloyl chloride with bicyclo oxazolidine- type alcohol 1. To a mixture of 1 (13.64 g, 40 mmol, 1eq), triethylamine (12.14 g, 16.8 ml_, 120 mmol, 3 eq), and dehydrated diethyl ether (40 ml_) in 200 ml_ two necks round-bottom flask at O0C under an argon atmosphere, the solution of methacryloyl chloride (6.27 g, 5.8 ml_, 1.5 eq) in 4OmL diethyl ether was added by dropwise for 2 hours, then the temperature was raised to room temperature. After 22 hours, the reaction mixture was washed by 10% Na2CO3 aq, extracted with Et2O three times, the organic layer was dried over MgSO4 and then condensed to give a crude product. The crude product was purified by alumina column chromatography to obtain 2 (hexane:ethyl acetate=50:1 ) (yield=78%, 12.7O g). To a solution of 2 (306.6 mg, 0.75 mmol) and 3 (356.3 mg, 0.75 mmol) in 1 ,4-dioxane (1.5 ml_), AIBN (12.3 mg, 5.0 mol% to total amount of monomers ) was added. The resulting solution was degassed by three freeze-pump-thaw cycles, and heated at 60 0C for 24 h under argon. The mixture was cooled, exposed to air, and poured into hexane (100 ml_). The resulting precipitate was filtered with suction, dried under vacuum at ambient temperature for 24 h, to obtain the bicyclo oxazolidine type copolymer 4 as a colorless viscous solid (600 mg, 90% yield). Mn=83 000, Mw/Mn=3.5. The amount of octanal incorporated into the copolymer is 29% wt. The obtained copolymer was soluble in water. 4 was dissolved in 5ml pH 3.0, 5.0 and 7.0 buffer solutions at room temperature to conduct the hydrolysis tests over 7 days period. The concentration of 4 was 1OmM based on octanal. In order to quantify the released octanal during hydrolysis by GC, 5ml hexane and 10mg of dodecane (an internal standard) were added into these solutions. After stirring the solutions for a predetermined time a portion (0.1 ml) of the solution was taken out from the hexane layer and analyzed by GC. The hydrolysis behaviors at pH 3.0, 5.0 and 7.0 are shown in Figure 1. From copolymer 4, octanal was released quantitatively after 51 h at pH 3.0. The released octanal at pH 5.0 was sustained to confirm the potential of 4 as a pro-fragrance because the acidic pH value of 5.0 approximates that of the ambient air. 4 was hardly hydrolyzed at pH 7.0 over a 7 day period. This indicated that 4 would not be degraded at the practical washing and rinsing conditions. 1 and 4 were added in 10ml pH 3.0 and 5.0 buffer solutions at room temperature to conduct their hydrolyses, respectively. Their concentration was 1OmM based on octanal. In order to quantify the released octanal during hydrolyses by GC, 5ml hexane and 10mg of dodecane (an internal standard) were added into these solutions. After stirring the solutions for a predetermined time a portion (0.1 ml) of the solutions was taken out from the hexane layer and analyzed by GC. At pH 3.0, 4 released octanal quantitatively after 51 h at pH 3.0. On the other hand, only 5.7% octanal was released from 1 at this condition after 7 days. At pH 5.0, 4 released octanal gradually, 16.2% octanal was released after 7 days. However, only 2.2% octanal was released at pH 5.0 after 7 days from 1. R9 represents a hydrophilic moiety, which contains at least a polar functional group preferably selected from ether, ester, amide, carbonate, carboxyl, carboxylic acid sodium salt, carboxylic acid amine salt, sulfone, sulfoxid, sulfonyl, sulfonic acid sodium salt, sulfonic acid amine salt, phosphonyl, phosphonic acid sodium salt, phosphonic acid amine salt, pyridinium and ammonium groups. wherein R1 1 is selected from any linear and branched C2-30, preferably C2-20, most preferably C2-io alkyl group wherein R12 represents a hydrogen atom or a methyl group. 3. The compound according to Claim 2, wherein R10 is — (CH2CH2 — O — )nH or — (CH2CH2- O— )nCH3, wherein n is a number from 1 to less than 50. 4. The compound according to any one of Claims 1-3, wherein in the structural element -CR1R2 the radicals R1 and R2 and in the structural element -CR3R4 the radicals R3 and R4 together each have at least four carbon atoms. 5. The compound according to any one of Claims 1-4, wherein R2, R4, R5, R6, R7 independently of one another denote hydrogen or methyl and R1 and R3 each denote a C4.24 hydrocarbon radical. 6. The compound according to any one of Claims 1-5, wherein the scent aldehydes and scent ketones are selected from the jasmonenes, ionones, damascones and damascenones, menthone, carvone, iso-E-Super, methyl heptenone, melonal, cymal; ethyl vanillin; helional; hydroxycitronellal; koavone; methyl nonylacetaldehyde; phenyl acetaldehyde; undecylene aldehyde; 3-dodecen-l-al, α-n-amylcinnamaldehyde, benzaldehyde, 3-(4-tert-butylphenyl)propanal, 2-methyl-3-(para-methoxyphenylpropanal), 2-methyl-4-(2,6,6-trimethyl- -2(1 )-cyclohexen-1-yl)butanal, 3-phenyl-2-propenal, cis-/trans-3,7-dimethyl-2,6-octadien-l-al, 3,7-dimethyl-6-octen-l-al, [(3,7-dimethyl-6-octenyl)oxy]acetaldehyde, 4-isopropylbenzaldehyde, 2,4-dimethyl-3-cyclohexene-1-carboxyaldehyde, 2-methyl-3(isopropylphenyl)propanal, decylaldehyde, 2,6-dimethyl-5-heptenal; α-n-hexylcinnamaldehyde, 7-hydroxy-3,7-dimethyloctanal, undecenal, 2,4,6-trimethyl-3-cyclohexene-l-carboxaldehyde, 1-dodecanal, 2,4- dimethylcyclohexene-3-carboxaldehyde, 4-(4-hydroxy-4-methylpentyl)-3-cyclohexene-l- carboxaldehyde, 2-methylundecanal, 2-methyldecanal, 1-nonanal, 1-octanal, 2,6,10-trimethyl-5,9- undecadienal, 2-methyl-3-(4-tert-butyl)propanal, dihydrocinnamaldehyde, 3,7-dimethyloctan-1-al, 1- undecanal, 10-undecen-1-al, 4-hydroxy-3methoxybenzaldehyde, trans-4-decenal, 2,6-nonadienal, para-tolylacetaldehyde; 3,7-dimethyl-2-nnethylene-6-octenal, 2-methyloctanal, α-methyl-4-(l-nnethyl- ethyl)benzeneacetaldehyde, 2-methyl-3-phenyl-2-propen-1-al, 3,5,5-trimethylhexanal, 3-propyl- bicyclo[2.2.1]-hept-5-ene-2-carbaldehyde, 9-decenal, 3-methyl-5-phenyl-1-pentanal, methyl- nonylacetaldehyde, citral, 1 -decanal, florhydral, 2,4-dimethyl-3-cyclohexene-1-carboxaldehyde, heliotropin. 8. The use according to the preceding Claim 7 in detergents and cleaning agents, fabric softeners and cosmetics, preferably after applying in aqueous medium at a pH below 7, more preferably at a pH of < 5. 9. Detergents or cleaning agents, fabric softeners or cosmetics containing compounds according to one of Claims 1 to 6. 10. The detergents or cleaning agents, fabric softeners or cosmetics according to Claim 9 wherein the pH-value of the agent is > 7. 11. The detergents or cleaning agents, fabric softeners or cosmetics according to Claim 9 or 10, wherein compounds according to one of Claims 1 to 6 are contained in the agent in amounts from 0,0001 wt% to less than 5 wt%, preferably less than 2 wt%, in particular less than 1 wt%, each based on a total amount of the agents. 12. The detergents or cleaning agents, fabric softeners or cosmetics according to any one of the preceding Claims 9 to 11 wherein they are solid, liquid or gel formulations. 13. The detergents or cleaning agents according to Claim 12 wherein the solid formulations are powder, granule, tablet or tab forms and the liquid formulations are solutions, emulsions or dispersions. 14. A method for prolonging the scent perception of detergents or cleaning agents, fabric softeners or cosmetics or solid surfaces treated with these, wherein compounds according to any one of Claims 1 to 6 are incorporated into the detergents or cleaning agents, fabric softeners or cosmetics. 15. The method according to Claim 14, wherein the scent substance is released by hydrolysis, preferably in aqueous medium at a pH below 7, more preferably at a pH of 5. ES2266582T3 (en) 2007-03-01 Controlled delivery system of a beneficial agent. ES2347307T3 (en) 2010-10-27 Arylacrylic acid esters useful as precursors for organoleptic compounds.